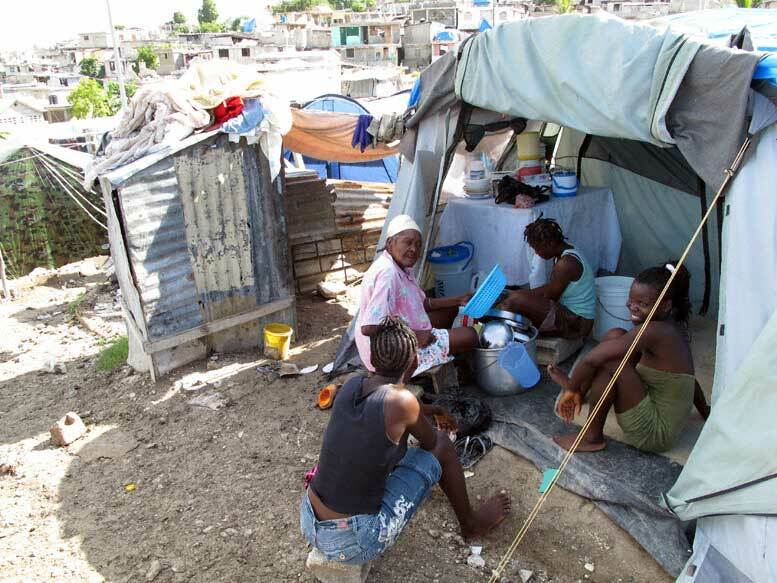 Port au Prince today is a crazy patchwork quilt of collapsed buildings, untouched structures and tent camps, sometimes with all three existing side by side. Brillant came to the hotel at 8 a.m. on Monday, his one day a week off, to pick me up to go explore its warp and woof. As we exited the hotel gate and turned right, there was painted on the hotel wall: “J.C. Duvalier Bon Retour”, or, roughly translated, “J.C. Duvalier, Please Come Back”. 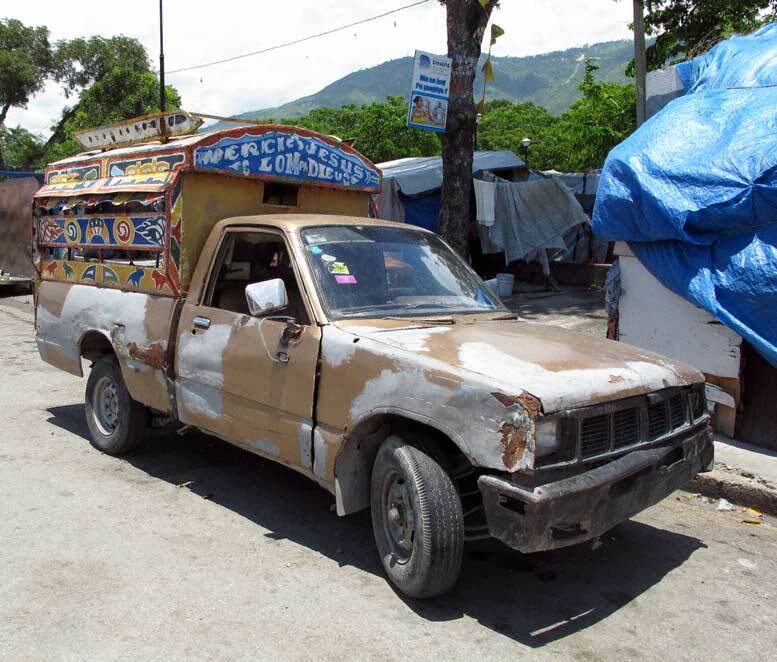 This is surely a sign of the desperate times through which Haitians are living. Our first stop was a small camp that ran up a hill to a wall that separated it from some intact houses. The large lot the camp sits on is owned by Farah Berthold, who also owns the Palm Inn Hotel. Approaching the camp, we passed a destroyed car next to a pile of garbage on the right side of the road and a dumptruck hauling rubble from the neighborhood. Two boys were playing before a large white tent at the camp entrance and an old woman sat against the front wall under a tarp selling mangoes. Upon entering the camp via a narrow dirt path, the first people we encountered was a group of four women, a matriarch and three women who appeared to be in their late teens to early twenties, cleaning up after breakfast. They were sitting at the entrance to their tent, which measured approximately 15 feet wide by 10 feet deep, with the front flap rolled up to the roof. There was a large pot containing other pots and pans sitting on the floor in front and in the back left corner was a table covered by a white tablecloth on which sat other cookware and plates. I took a couple of pictures and then we proceeded further up into the camp, almost immediately encountering three men who engaged Brillant in conversation. After a few moments, Brillant turned to me. So, we followed them up a winding path just wide enough to snake between the tents to one occupied by two young women, an older woman who was probably one or both of their mother and a young girl of five or six who was likely one of the young women’s daughter. Two of the men squeezed into the tent, which, to my surprise, had an oscillating fan hooked up to an extension cord drawing electricity from somewhere, and I shot a few pictures. 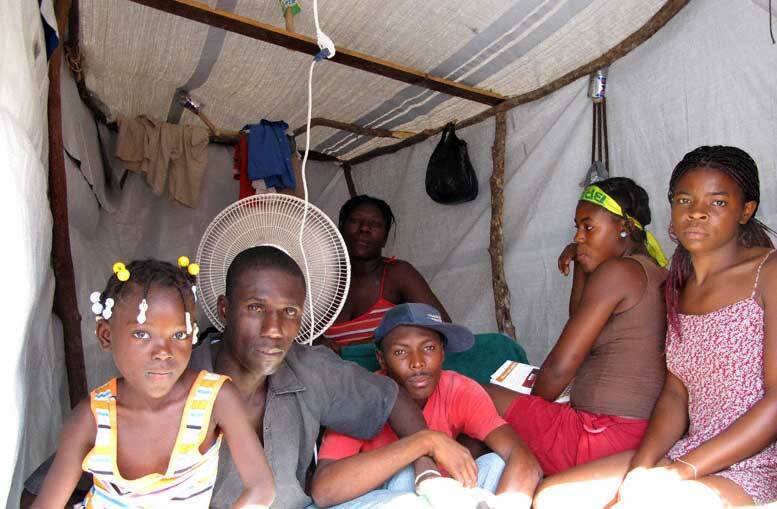 As Brillant and I left, the whole group seemed very grateful, not realizing, of course, that putting the pictures on the web would do nothing to help them get a tent. Leaving the Farah Berthold camp, we set out on foot for the Mais-gate camp near the airport. Across the main airport road and a sewage canal, the camp is medium size, much larger than the camp we had just left, but not nearly as large as the Acra camp we would visit later. Just after traversing the bridge into the camp, I glanced down to my left to see a little girl walking past a fetid sewage pond 30 or 40 feet across by 40 or 50 feet long set among the tents like a lake at a state park. We didn’t spend a lot of time at Mais-gate, but we did find the WP Cine, a large tent with a television, chairs and benches that was offering a double feature of World Cup soccer games that day for ten goudes, or about a nickel. From Mais-gate, we took a tap-tap to Brillant’s house because he wanted to show me where he lives. 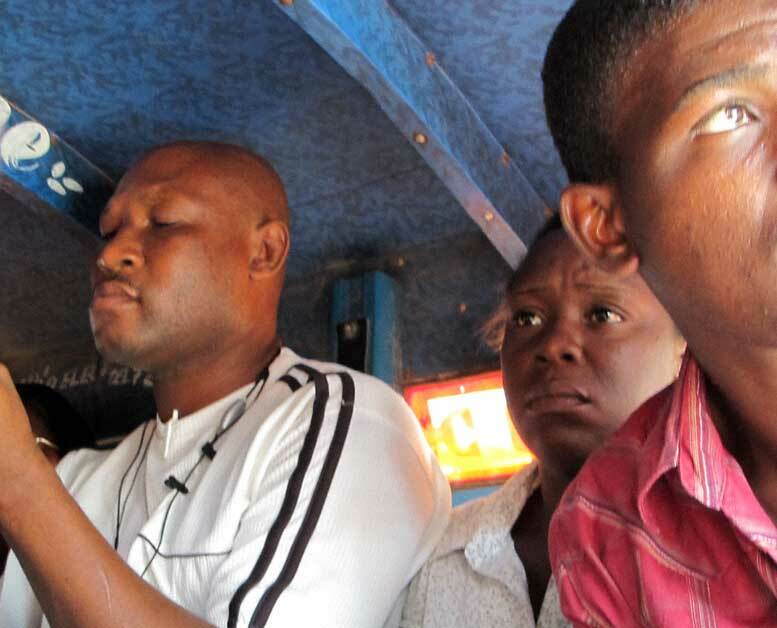 The tap-tap is the most common form of public transportation in Port au Prince. Basically, it is a small pickup with two benches running down either side of the bed, covered by a usually colorfully painted wooden camper top with slatted sides to allow air to circulate. Each tap-tap is personalized and usually the front of the camper will feature a motto, or an inspirational saying, often religious in nature, such as “Merci Jesus, Lom de Dieu” (Thank you Jesus, Son of God). But really, the passengers are the ones in need of divine assistance. In contrast to some other modes of public transportation, buses or subways for example, the longer a passenger is on a tap-tap, the worse his or her seat becomes. This is because as some people exit the tap-tap and new people board, those who remain slide progressively toward the front and eventually find themselves squeezed between four or five other people and the back of the pickup’s cab, in the position that offers the least ventilation. I believe that this situation is largely responsible for the nearly constant turnover in tap-tap passengers, as the people at the front reach the limit of their endurance and exit simply in order to board another tap-tap where they can begin again at the rear. Fortunately, Brillant and I reached our destination before being pressed all the way to the bulkhead. Once off the tap-tap, it was but a short walk to Brillant’s house. Half of a stucco duplex, it has two rooms separated by a curtained door. 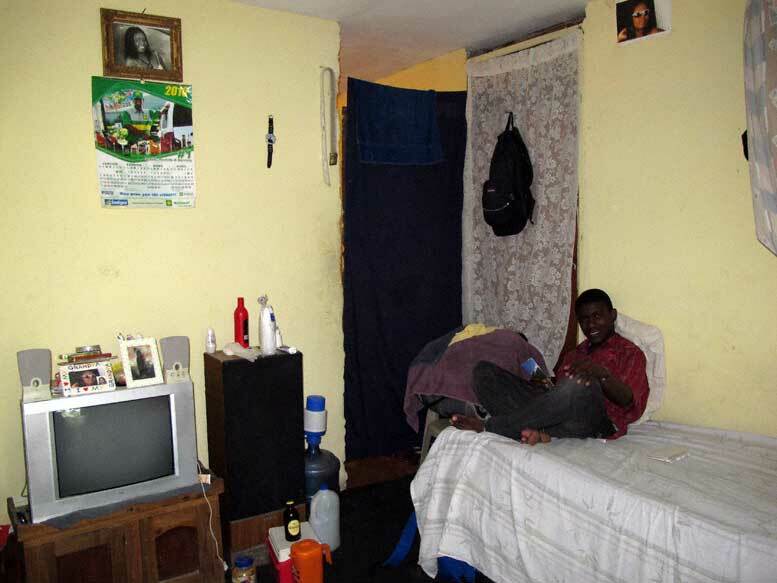 The first room is the size of an average bedroom in an American home and is tidily furnished with a twin, or twin and a half, bed, a plastic chair, a television on a stand and two large speakers. The room through the curtain is about the same size, although perhaps not quite as deep, and is used primarily for storage. It does, however, have a twin bed. Not much space for five young men, but, on the other hand, a lot better than a tent.